Did you know that female athletes suffer knee injuries five to six times more often than males? When we think about the general shape of men versus women, it’s easy to conclude that the skeletal makeup of women is a slightly smaller replica of a man’s. However, there are major differences in our bone structures. These differences can account for the significantly higher percentage of women who suffer knee damage. The most obvious reason is that women typically have wider hips, so their thigh bones angle downward more drastically than men’s. The “Q” angle applies more pressure on the knee. Another reason is that women undergo bone and muscle changes during puberty that create laxity in ligaments. This flexibility combined with more intense joint motion explains why women are more prone to ACL injuries (women are eight times more likely to suffer an ACL injury than men). Scientists have also pointed to other reasons like a slower reflex reaction, posture, and high estrogen levels to explain why women experience knee injuries more frequently. 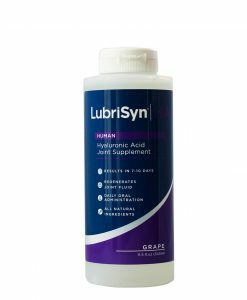 So, what can you do to support and repair painful knees? One way would be to work both your quadriceps and hamstrings so that neither has a bigger pull on your knee joint. Wear supportive shoes with a proper arch, and practice landing on the balls of your feet. 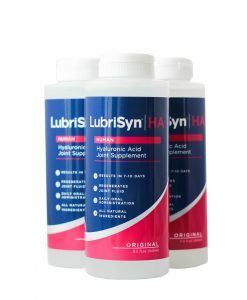 If you’ve already suffered damage and experience joint pain on a daily basis, LubriSynHA can provide you a quick, easy, and affordable option to cope with your achy knees. 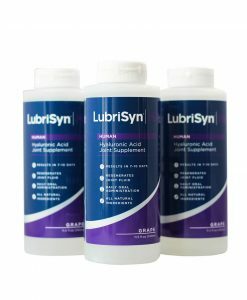 Our formula addresses pain by lubricating joints that have suffered fluid deterioration. We can help keep you get moving with an improved range of motion, kicking knee pain to the curb. This entry was posted in LubriSynHA For You. Bookmark the permalink. 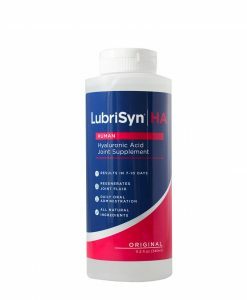 How Exactly Is LubriSynHA a “Natural” Supplement?